Ty Nsekhe, T (Bills): Two years, $9MM. $6.7MM guaranteed. $2MM signing bonus. $1.5MM available annually in playtime incentives. $1.5MM playtime escalator in 2020 (Twitter link via Aaron Wilson of the Houston Chronicle). Henry Anderson, DL (Jets): Three years, $25.2MM. $17MM guaranteed. $1.75MM available via annual incentives. $850K sacks-based escalator in 2020 and 2021 (Twitter link via Wilson). Phillip Dorsett, WR (Patriots): One year, $2.6MM. $500K signing bonus. $600K in per-game roster bonuses (Twitter link via Field Yates of ESPN.com). Ereck Flowers, T (Redskins): One year, $3.25MM. $1.5MM guaranteed. $750K in playtime incentive (Twitter link via Jordan Raanan of ESPN.com). Mike Iupati, G (Seahawks): One year, $2.75MM. $2.25MM guaranteed. $1.25MM signing bonus. $500K in per-game roster bonuses. $500K available via playtime incentives (Twitter link via Brady Henderson of ESPN.com). Terrence Brooks, S (Patriots): Two years, $3.25MM. $1.305MM guaranteed. $500K signing bonus. Playtime bonuses available in 2019 and 2020 (Twitter link via Wilson). Jordan Matthews, WR (49ers): One year, $1.8MM. $300K signing bonus (Twitter link via Tom Pelissero of NFL.com). Dominique Rodgers-Cromartie, CB (Redskins): One year, minimum salary benefit. No guaranteed money (Twitter link via Pelissero). Jamize Olawale, FB (Cowboys): Three years, $5.4MM. $2.8MM guaranteed. $1.8MM signing bonus. 2021-2022 are option years that must be exercised prior to end of 2020 league year (Twitter link via Wilson). Brent Qvale, OL (Jets): One year, $1.4MM. $550K guaranteed. $1MM in incentives (Twitter link via Brian Costello of the New York Post). Henry Anderson may not be relocating this offseason. The Jets are close to an agreement that would keep the defensive end in the Big Apple, according to Manish Mehta of the New York Daily News. It is a three-year, $25.2MM deal for Anderson, with a maximum value of $33MM. Rich Cimini of ESPN.com tweets that Anderson will net a hefty $17MM guarantee. Acquired for a seventh-round pick on 2018 draft weekend, Anderson produced in his first Jets season, registering a career-high seven sacks. This tied for the Jets’ team-high mark, despite Anderson playing in fewer than 60 percent of New York’s snaps. He stands to rejoin Leonard Williams, who was once viewed as a trade candidate, on Gang Green’s 2019 defensive line. The Colts traded Anderson because they were moving to a 4-3 defense. While most assumed Gregg Williams coming aboard as Jets DC would mean they would use that look, they are staying as a 3-4 base team for now. This helps Anderson, who stands to receive a considerable raise from his rookie deal. While this unit will not be backed by both C.J. Mosley and Anthony Barr, with the latter spurning the Jets to return to the Vikings, the Jets have made a concerted effort to improve their front seven this week. 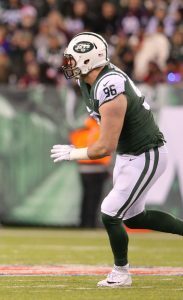 The Jets are interested in bringing back free agent Henry Anderson, Manish Mehta of the Daily News hears. The defensive lineman’s seven sacks tied for the team lead last season, even though he played in only 59.7% of the snaps. The Jets plan to meet with Anderson’s camp during Combine week, at which point they’ll discuss a new deal. Anderson earned just $1.9MM last year, so it’s safe to say he’s in line for a pay bump. The Colts traded him to the Jets in April of last year for a seventh-round pick and he has proven to be a tremendous value for Gang Green. Anderson was a poor fit for their 3-4 scheme, but he was solid in the Jets’ 4-3 front. The Jets probably won’t retain most of their 23 unrestricted free agents, but Anderson appears to be a priority for them. With upwards of $102MM in cap room, the Jets should have ample space to re-sign Anderson and pursue some of this year’s biggest difference makers on the open market. They may use some of that available cash to add Jaguars wide receiver Donte Moncrief, who stands out in an otherwise iffy WR class. Recently hired to coach some of his former teammates, DeMarcus Ware will likely be tasked with the early development of Bradley Chubb. Ware said during an interview with the Talk of Fame podcast the Broncos‘ first-round pick can have the type of career he had. But the future Hall of Famer identified Chubb’s larger frame as a different element that will thrive alongside Von Miller. The N.C. State-honed edge defender is noticeably bigger than fellow Miller sidekicks Shaquil Barrett or Shane Ray, and weighs more than Ware did during his Denver years. Whether that’s an impediment to speed rushes remains to be seen, but Chubb will factor into the Broncos’ pass rush immediately — especially considering Ray has encountered more wrist trouble. Since the Broncos primarily align Miller opposite of opponents’ right tackles, Chubb will have plenty of speed-rush opportunities on the blind side where Ware once played. Mike Vrabel expects all Titans to be ready for training camp, with the exception of Jack Conklin. The third-year right tackle tore an ACL in the team’s playoff loss to the Patriots and has not participated in offseason work. Vrabel mentioned the PUP list as a possibility to start camp, Jim Wyatt of TitansOnline.com notes. Wyatt adds that it’s too early to tell if Conklin will be ready for Tennessee’s regular-season opener. The Jaguars look set at quarterback, despite fairly consistent scrutiny. Cody Kessler is positioned to back up Blake Bortles, John Reid of the Florida Times-Union writes, adding the only way he can foresee the defending AFC South champions signing a veteran passer will be due to a Bortles injury or Kessler being overwhelmed by the job. Bortles has been an oft-derided player during his time in north Florida, but the Jags just re-signed him to a three-year extension and did not make a serious investment in competition for the fifth-year QB this offseason. Kessler has fared well in the offseason, per Reid, who also envisions seventh-round rookie Tanner Lee being practice squad-bound. Acquired via draft-weekend trade, Henry Anderson is in the running to replace Muhammad Wilkerson in the Jets‘ starting lineup. Todd Bowles said (via Brian Costello of the New York Post) the former Colts defensive end would be on the field when the team deploys a four-man front, which would mean an important assignment given how often nickel sets are utilized. The Jets also signed Courtney Upshaw recently and are planning to use third-round defensive tackle Nathan Shepherd as an end as well. Upshaw was a Ravens lineup regular from 2013-15 but settled in as a Falcons backup the past two seasons. Jettisoned by the Colts because of their impending move to a 4-3 look, Anderson started eight of the nine games he suited up for last year. Terrelle Pryor‘s injury concerns have been well-documented, but as Darryl Slater of NJ.com observes, the Jets are also dealing with injuries to CB Morris Claiborne and OLB Jordan Jenkins. Both Claiborne and Jenkins are expected to be ready for the start of training camp, while the status of Pryor and starting free safety Marcus Maye is still up in the air. Slater also wonders who will start at OLB alongside Jenkins. David Bass and Josh Martin are candidates, as is Lorenzo Mauldin, though Slater suggests Mauldin is on the roster bubble. Slater also indicates that Henry Anderson may have the leg up in the battle for the Jets‘ starting defensive end position opposite Leonard Williams — New York desperately needs someone to take double teams away from Williams — and that Andre Roberts appears to be leading the competition for Gang Green’s punt returner job. He adds that wideout Chad Hansen has impressed this spring after being a non-factor in his rookie campaign last year. Rich Cimini of ESPN.com also likes what he sees from Hansen, and he says TE Neal Sterling and RB Elijah McGuire are other under-the-radar players to impress for the Jets this spring. Sam Darnold, meanwhile, is very much on the radar, and Cimini says Darnold has done nothing to suggest he cannot be a quality starter in the NFL. The most important lesson learned during the Eagles‘ spring practices, per Zach Berman of the Philadelphia Inquirer, is that Carson Wentz is progressing in his recovery from an ACL tear and could be ready to go in Week 1. However, as Berman points out, the defending champs have plenty of injury concerns outside of Wentz, though no key players appear at risk of missing any regular season time at this point. 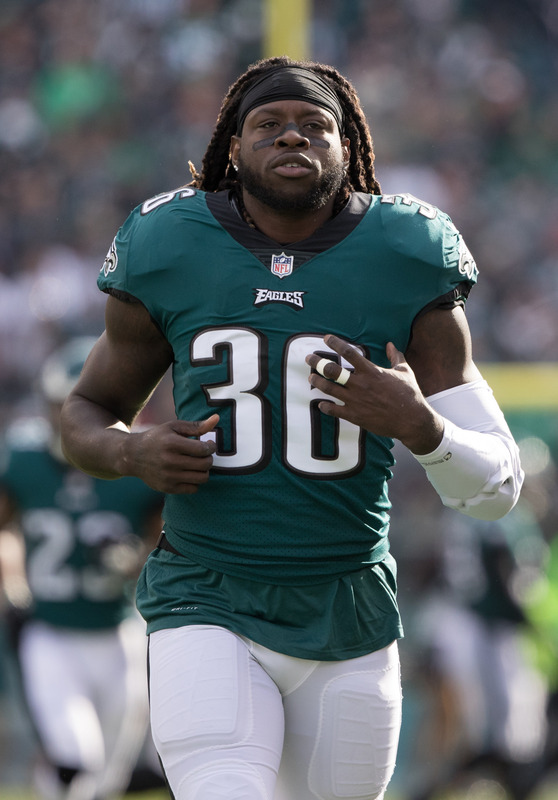 Berman also writes that Jay Ajayi is the Eagles’ unquestioned No. 1 running back — in stark contrast to the summer of 2017, when the team was emphasizing a committee approach to the offensive backfield — and he names De’vante Bausby, Nate Gerry, and Dallas Goedert as young talents who have stood out in the spring. Gerry, a 2017 fifth-rounder who converted from collegiate safety to professional linebacker, could compete for a starting LB job this year, Berman says. Speaking of Bausby, Eliot Shorr-Parks of NJ.com is also impressed with the 25-year-old’s work this spring, which may be enough to allow the Eagles to trade Ronald Darby. Seahawks‘ 2018 seventh-round pick Alex McGough stood out this spring and has a legitimate chance to be Russell Wilson‘s backup this year, per Bob Condotta of the Seattle Times. Condotta also notes that Seattle’s first-round choice, Rashaad Penny, has looked the part and has also shown improvement in his pass-blocking technique, which will help him see more of the field this year. TE Eric Ebron has been perhaps the most impressive newcomer for the Colts this spring, per Stephen Holder of the Indianapolis Star, who also says 2018 fourth-rounder Nyheim Hines was the most exciting rookie to watch. Hines, a running back from NC State, has the explosiveness and versatility to thrive in new head coach Frank Reich‘s scheme. Jim Wyatt of TitansOnline.com says Harold Landry, the Titans‘ second-round draft choice this year, is living up to his draft pedigree and that, while he may have a hard time unseating veterans Derrick Morgan and Brian Orakpo as a starting OLB, he should see plenty of action as a situational pass rusher to begin his career. Wyatt also says Tennessee’s cornerbacks have been the most impressive position group of the spring. It was reported over the weekend that Colts quarterback Andrew Luck drew trade interest from teams as far back as the 2017 trade deadline. Team owner Jim Irsay addressed those rumors, saying teams were willing to part with a small fortune to acquire the quarterback, Fox 59’s Mike Chappell writes. Though he missed the entire 2017 season and has yet to resume throwing, Luck would still almost assuredly force teams trying to acquire him to give up multiple No. 1s and then some. A franchise quarterback who is just 28 years old rarely if ever pops up on the market. Not that there is a market, as the Colts reportedly laughed off inquiries at the time. Luck led the Colts to an 11-5 mark and the playoffs in each of his first three seasons before missing half of the 2015 season with an injury. He returned and played 15 games the following campaign, going 8-7 and just missing the postseason. Though he was reportedly close to throwing a ball in January, Luck told reporters in early April that he has yet to throw an NFL-sized ball and is not rushing it. In addition to laughing off trade requests, team general manager Chris Ballard told reporters about trading Andrew Luck — “I’m not putting that on my resume,” Michael David Smith of Pro Football Talk writes. Though Irsay notes teams were willing to give up a king’s ransom for the quarterback, Ballard didn’t seem to be interested in the move no matter the cost. On Saturday, the Colts shipped defensive lineman Henry Anderson to the Jets in exchange for a seventh-round pick. Addressing the trade, Ballard said the deal was based on scheme fit, saying Anderson worked better with the Jets than Indy, Chappell tweets. Ballard also added that the team is bringing in former Ohio State quarterback J.T. Barrett for rookie minicamp and that he is not signed to the team, Chappell tweets. Barrett registered one of the greatest runs as a Buckeye, setting the school record with 38 victories, becoming the team’s only three-time captain and leading the team to a 4-0 record over rival Michigan. Drafted three years ago to play in a 3-4 scheme for the Colts, Henry Anderson is on the move to a familiar defense. Now set to use a 4-3 look, the Colts shipped the interior defender to the Jets in exchange for a seventh-round pick, Adam Schefter of ESPN.com tweets. Indianapolis will receive the No. 235 overall choice. 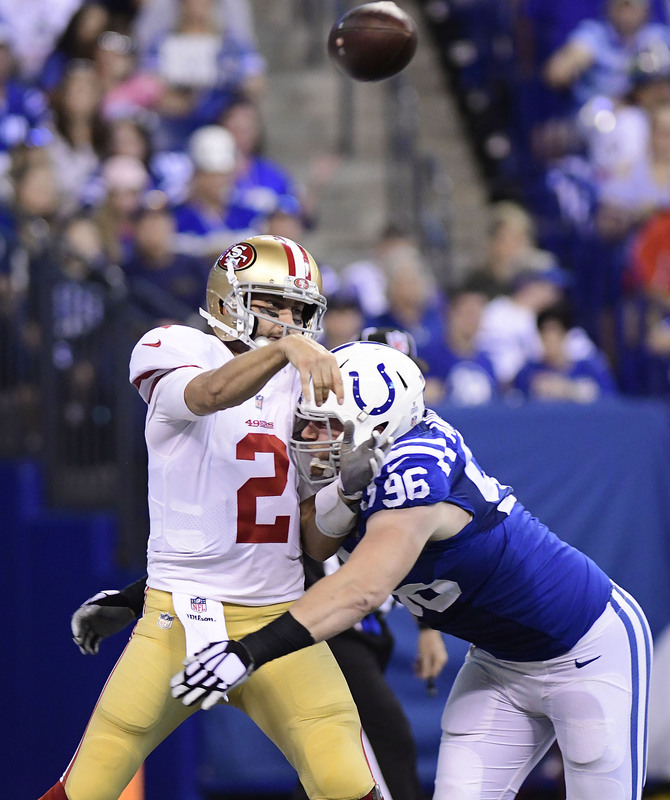 Anderson served as a starter for most of his time with the Colts, including eight games with the first unit last season. He only played in nine games, however, and has never exceeded 11 in a season. The 2015 third-round pick, who registered a career-high two sacks last season, has one year remaining on his rookie contract. The Colts took two defensive linemen in this year’s draft in Kemoko Turay and Tyquan Lewis (both in Round 2) and signed Denico Autry from the Raiders in free agency. The Jets released Muhammad Wilkerson and bypassed the D-line class in free agency to this point. They did select Division II dynamo Nathan Shepherd in Round 3 on Friday. The Colts will place defensive tackle Henry Anderson on injured reserve after he suffered a laryngeal fracture during Sunday’s game, according to Adam Schefter of ESPN.com (Twitter link). Anderson will undergo surgery on Friday. Anderson’s injury — a break in the neck region that not only sounds incredibly painful, but can cause life-threatening airway obstruction — will end the third-year interior defender’s 2017 campaign. While the severity of Anderson’s injury doesn’t sound as though it would have let him return this year, the NFL’s IR rules wouldn’t have allowed it, anyway. The league stipulates an eight-week absence before a player can come off IR, meaning Anderson would have missed regular season’s second half. While the Indianapolis defense has been forgettable this season (bottom five unit in both DVOA and adjusted sack rate), Anderson has shined as one of the club’s few bright spots. While Anderson has been effective for the duration of his NFL tenure, he’s continued that production in 2017 while increasing his snap rate to 62.3%, 30% greater than his average heading into the season. The results have been excellent, as Anderson ranks as a top-40 interior defender among 117 qualifiers, per Pro Football Focus, which gives the former draftnik favorite positive marks as both a run-defender and a pass rusher. He’s eligible for an extension this offseason, and will earn $720K this year before hitting the free agent market in 2019.